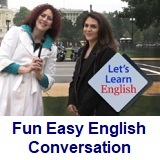 ﻿ Fun Easy English - new classroom free online classes english language lessons speaking listening writing reading january 11. 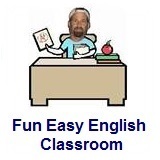 Today in the Fun Easy English classroom you will learn a little about writing the English alphabet in manuscript and cursive. You will also learn the ABC Song. Why am I teaching the ABC Song in an adult classroom? After teaching English in Japan for many years I realized this song was being taught incorrectly. Different words and different rhythm. Knowing the correct way to write the English alphabet in manuscript and cursive is extremely important. Being able to recognize and write both manuscript and cursive will make it easier for you to understand, not only printed material, but handwritten information as well. It also feels pretty good if people think your handwriting is beautiful. Writing style used in printing and electronic communications. Easy to read since the letters are separated. Generally slow style of writing. Any style of handwriting which is designed for quickly writing down notes and letters by hand. Can be easy or difficult to read depending on the skill of the writer. Cursive is generally faster to write than manuscript. Hi. In the classroom today you will learn the ABC Song. The ABC Song is an alphabet song. An alphabet song is any song used to teach children the alphabet, used in kindergartens, pre-schools and homes around the world. 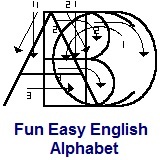 The ABC Song is one of the best known English language alphabet songs, especially in the United States. The song was first copyrighted in 1835 by the Boston based music publisher Charles Bradlee. The theme is that used by Mozart for his piano variations commonly recognizable as "Twinkle, Twinkle, Little Star". The lyrics of the ABC Song are as follows. Most American kids begin learning the English alphabet between 2 and 3 years old. They usually begin reading between 3 and 4 years old. 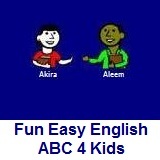 Write the English Alphabet with Akira and Aleem. Hi. We are Akira and Aleem. We will teach you the ABC's. Now, let's learn something about Akira and Aleem. Hi. My name is Akira. I am from a small town in Japan. I am an English language student. there are 2 A's in my name. Hi. My name is Aleem. I am from a small town in India. there are 2 E's in my name. In this lesson Anna has many things to do. She needs to go to the library, post office, bank, and store. Marsha helps her find these places in their neighborhood. Anna: Hello! DC is a city for walking. In our neighborhood, I can do all my errands. Marsha, before we get ice cream, I need to return three books to the library. Where is the library? Marsha: It is on this street on the corner. Anna: Marsha, I can return the books here. Marsha: Anna, what are those in the books? Anna: Marsha, these are letters to my family and friends back home … four letters! Is there a post office near here? Marsha: Um, no. The post office is far from here. But there is a mailbox across from the store. Anna: Marsha, now I need to buy stamps. Marsha: Do you have cash? Anna: No. Is there a bank near here? Marsha: There is a bank behind you. Anna: Thanks, Marsha. You know our neighborhood so well. Anna: Now I have cash. I can buy stamps. Marsha: That store sells stamps. Marsha: Do you have more cash? Marsh and Anna: Ice cream!! Anna: I love my new neighborhood! Everything is near our apartment! Even hair salons*, and ice cream! In this video, learn to say the new words. Learn to thank someone for giving you help. In this video, you ​learn to show strong feelings by saying words slower and louder. Where do you do errands in your neighborhood? Write about three places you go in your neighborhood. Write about them in the Facebook Comments section below. Then practice with a friend. Click lesson activity to get the printable PDF version. The page opens to a new window.